After Saturday's first team defeat the last thing I wanted to see was another one but unfortunately that's what I got last night with the Accies under 20 team being well beaten by Hibs courtesy of goals from hat trick hero no. 10 Cummings and a single strike from no. 9 Caldwell. Accies started brightly enough and in just over 2 minutes had a shot on goals but it was Hibs who scored first in 19 minutes through Caldwell. Accies keeper Currie blocked a Hibs shot but the ball fell to Caldwell who struck it well. This sparked a period of Accies dominance but shots from Mcnaught, Ryan (twice) and Brophy (twice) in a 13 minute spell were all cleared or saved. As half time approached it looked as though Accies would go in a goal down but in 41 minutes Currie failed to hold a ball and Cummings was on hand to put the ball in the back of the net. The second half started in similar fashion with Accies having a free kick just outside the box but Ryan's attempt was well over. Cummings added a third for Hibs in 69 minutes when he met a cross with a spectacular overhead kick that gave Currie no chance. Hibs compounded a miserable night for Accies when Cummings completed his hat trick in 77 minutes. The ball fell to him in the Accies half and evading a defender he had only the keeper to beat which he did. This result leaves Accies in sixth place in the Under 20 league table with 20 points but still only 2 behind leaders Inverness and with 2 games in hand. Also at the game last night following on his saturday visit was Alloa manager Paul Hartley. As he was supposed to be interviewed by Inverness for thier vacant managerial position yesterday he must have flown down the A9. After losing their last two games, Accies under 20's got back to winning ways at New Douglas Park on Tuesday night with a comfortable 2 - 0 win over Dunfermline Athletic. Before the kick off I was able to admire the progress that Peter Howson is making on his wall mural. Away fans and those in sections A to D of the main stand are going to have a cracking view and if they tire of the football they can at least admire the mural. Captaining the Accies team was Jesus Garcia Tena and although he didn't score this was a captains' performance earning my man of the match vote. Accies started brightly and in 3 minutes a cross from Craig Johnston fell to Tena who hit the ball awkwardly passed the goal post. Three minutes later an identical cross from Johnson was cleared just before Tena could get a foot to it. In 17 minutes Mcgrath found Tena again but he was quickly ruled ruled offside. Dunfermline came into the game later in the first half with corners in the 30th and 33 minutes but made little use of them. Their best and possibly only chance of the game came in 39 minutes when the ball fell to Dunfermline's no 7 Ryan Ferguson near the goal line, but Currie for Accies managed to turn the ball past the post for a corner. Shortly afterwards Accies broke up the field and a cross from Tena on the left hand side of the park was expertly struck by Mcgrath from 10 yards out side the box giving the Dunfermline keeper no chance. The second half was somewhat disjointed with both sides making multiple substitutions but Accies were rarely threatened and secured all three points in 80 minutes when the ball fell to Greg Docherty, who from about 20 yards struck the ball past an again helpless Dunfermline keeper. That was all the action and I wonder if Tena may make a first team appearance on Saturday or will Mcgrath be filling a strikers slot? Accies - Currie, Finnie, Mcmann, El Zubaidi, Kilday , Watson, Longridge, Docherty, McGrath, Tena (c), Johnston Subs Smith, Armstrong, Harrison, Granger, Quinn. In September I reported that Richie Burke of Livingstone was the first managerial casualty of the season and wondered if the axe would fall on Danny Lennon or John Brown? Such are the vagaries of football that six weeks later both these managers look safe for the time being with Saint Mirren sitting in 11th position in the Premiership but 15 points above Hearts and Dundee suddenly putting a series of wins together to claw back within one point of Accies before last weeks' defeat. But there have been other casualties. Perhaps no surprise that Jimmy Boyle of Airdrieonians was October's, quickly replaced by Gary Bollan himself somewhat surprisingly sacked by Livvie last season despite achieving two promotions. November is only a day old and the biggest name so far has joined the ranks of the unemployed with Pat Fenlon 'resigning' from his post at Hibernian after a 2 year spell that so him take the club to 2 Scottish Cup finals but fail to improve significantly on their league position and this week saw his team knocked out of the League Cup by arch rivals Hearts. A winner of 5 titles in the League of Ireland he has found Hibs a tougher nut to crack and the club is now seeking their 10th manager in 16 years according to the BBC. So whose next ? The spotlight in recent weeks has been on Kilmarnock, Queen of the South and Morton. Despite funds which most recently allowed him to sign Nacho Novo on a short term contract its not looking good for Morton's Allan Moore. But one thing I can say with certainty is that there will be no shortage of candidates for whatever vacancy occurs. Accies can take nothing for granted when they make the short drive to face second placed Falkirk at the Falkirk Stadium. The Bairns have started well with seven points from nine whilst Accies are in a rich vein of form with maximum points so far. Alex Neil is hoping to add a couple of new faces before the transfer window slams shut on Saturday and is hoping Garcia Tena, formerly of Livingston is one of them. He has been training with Accies for several weeks and Neil is quoted in the Advertiser as hoping he will be signing before the deadline. I am planning on making the journey up to the game and seeing my first away game of the season, I think it will be close and would bite your hand off for a draw just now. We are in a good run of form but I don't want to see us lose and Falkirk overtake us into first place. I tipped Falkirk and Dundee to be our two main challengers this season with the three of us being the top three come the end of season, It didn't however put me off my £10 bet at 8/1 on Accies to win the league. Accies will be at home to St Johnstone in the last 16 of the League Cup, following this morning's draw. On current form, and with home advantage, this is certainly a tie we would hope to win. It is again a good time to be an Accies supporter. The managerial change has proved to be a positive move despite an early season Ramsdens Cup defeat and Alex Neil is assured of my support through thick and thin, as was his predecessor. The signing of MAC (pending formalities) should be another step forward, with my only question being why no other teams seem to have been chasing him given his record in Scottish football. Saturday's opponents Queen of the South are one of only 3 unbeaten teams in the Scottish Professional Football League Championship after 2 rounds of games. Another tight 2nd tier season looks to be in prospect. 39 goals have been scored in 10 games this season with Accies and QoS providing 12 of these - the difference in the teams being the solidity of Accies' defence. I can't see too many changes to the team after the fine home win against Dumbarton, but Andreu must be close to a start - but at the expense of whom? While QoS are one of the form teams in the league to date (early, I know) Accies are at home and this is the sort of game we must win if we are to challenge for the one direct promotion spot. Unlike many, I am no fan of play-offs - but it seems that in this instance they are the closest we will get to a 2nd promotion place, so are welcome none the less, despite the fact that they undermine the league structure and are a blatant commercial ploy. I reckon this season must be close to being the 50th anniversary of my first game at Douglas Park - promotion would be a fine way to celebrate and I'm not fussed about the route we take. 3 points on Saturday, please. Mickael Antoine-Curier looks set to return to Hamilton Accies, the official site has revealed. Before everyone gets too excited about the return of 'MAC', the club's resident blazer, Scott Struthers, has pointed out there are still registration problems to overcome before the transfer window closes, and he can't be included in this Saturday's squad. Fingers crossed these are resolved in time, as MAC at his best is exactly the type of player we need to challenge in the Championship. 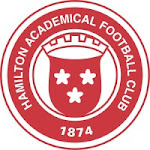 In his previous spells at Accies, between 2009 and 2011, MAC made 39 appearances and scored 11 goals (source: unofficial but generally reliable Accies Appearances website). This Saturday, Accies host Dumbarton for the first home match of the season and our first competitive match on the new artificial surface at NDP. After last week's excellent away victory against Raith Rovers there is bound to be some confidence and optimism amongst the players, management team and the fans. The big question is whether the promise shown in the last two victories can continue. According to the OS, the injuries to Longridge and Routledge will keep both on the sidelines for a few more weeks. That should mean the only change to the starting eleven will be the return of our captain, Martin Canning to the heart of the defence alongside Mikey Devlin. The dominant performance of Alex Neil last week must leave our manager no choice but to pick himself to start again this week. Last season Dumbarton showed they were capable of virtually anything - good & bad! However there's no doubt they are a much more capable outfit under the stewardship of Ian Murray. They managed to grab a late equaliser last week to earn a good point at home to Falkirk and I believe they will be no pushovers. It's still very early in the season to identify the form sides, however if we are aspiring to achieve a top four finish then this match is the type of game that we really need to be winning. I'm looking forward to an open, entertaining game with a narrow victory for Accies. The phoney war is over so to speak when on Saturday Accies travel to Kirkcaldy to take on Raith Rovers in a historic first game for both sides in the new league set up. Raith seem to have had the upper hand in recent seasons at Starks Park but we have won our last 2 games against them home and away, 2-0 on both occasions. Going into this game Canning is suspended and Alex Neil seems to be still struggling with his role as a player manager in terms of playing or not. Against Airdrie he sat on the bench but at Stirling last week resumed his place on the park perhaps mindful that exiting two cup competitions in a row would not set the tone for the upcoming season. Alongside Canning he clearly had the desired effect so I fully expect him to play this Saturday. Raith have had a good start so far winning both their cup games although extra time was need against Stirling. Up front they have former Accies loanee Greg Spence who scored 15 goals last season and summer signing Calum Elliot. Calum appeared to be heading for Livingstone but ended up signing a one-year deal with Raith. If he can keep injury free, I suspect he will be a key player and he grabbed 2 goals in Raith's 6 - 0 demolition of Queens Park last week. While Chairman Les Grey is quoted in the Advertiser today (Friday) that he is “still looking to bring in two or three players before August is up.” it should be more or less the same squad as last week with perhaps a full 90 minutes for Andreu and a place on the bench for Andy Ryan who returns after suspension and played midweek against Rangers under 20’s. Accies travel to Stirling on Saturday to play the Binos in a match between 2 teams already eliminated from the Ramsdens Cup. This League Cup fixture (there doesn't seem to be any sponsor for the League Cup yet) is hardly one to set the pulse racing, but for Accies it represents a second chance to record a victory against lower-league opposition before the league kicks off in 2 weeks time. As ever with Scottish football there is a curiosity, in this instance Albion were dumped out of the Ramsdens Cup by Raith Rovers, Accies first league opponent in 2 weeks time. So this game is something of a form guide - maybe. It is difficult to see Accies showing more commitment to this game than was shown last week, which suggests there may be doubts about participation by Neil and Canning. Hopefully new signing Andreu will add bite in midfield and Keatings will show his true colours up front. Ryan is still suspended for this game. A win would certainly be a morale booster, but with the obvious priority being the league it is likely that success in this game will be provided by a slightly less than optimum Accies team. 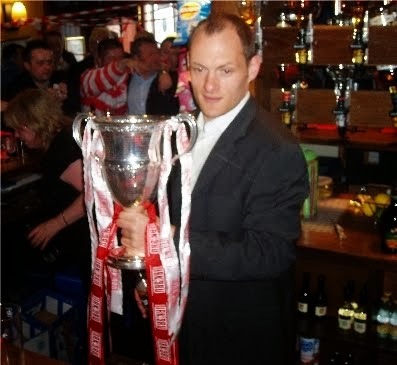 Feel free to question Club Chairman Les Gray about Accies' priorities for the coming (current?) season at the Fans' Forum to be held in the function suite at NDP at around 5pm on Sunday 4 August. Further details available on the official site.